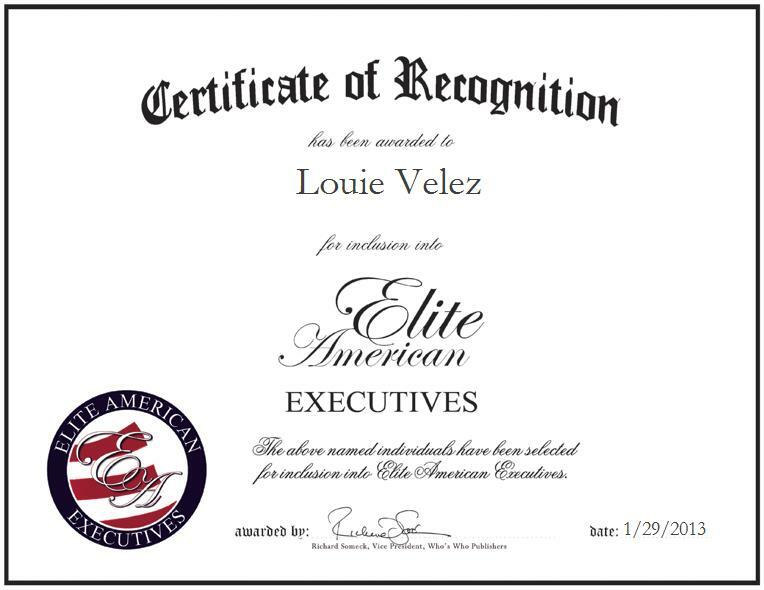 SAN DIEGO, CA, January 29, 2013, Louie Velez, Assistant Vice President and Business Systems Analyst V for Union Bank, N.A., has been recognized by Elite American Executives for dedication, achievements, and leadership in banking. Over the course of a successful career, which has spanned more than 30 years, Mr. Velez has garnered a reputation of distinction for his drive and attention to detail, and for his commitment to lending an obliging hand at every level of today’s business world, and its ever changing professional climate. At his current post, Mr. Velez makes the most of the proficiencies he has nurtured over the years, which encompass office service, cash management, productivity services, application and software development, and capacity management services skills. Mr. Velez specializes in central administration, effective vendor and partner relationship, and risk management enterprise solutions, leadership core competency in team building, operations and project management, as well as software development. He is also skilled in the areas of quality assurance and control, implementation, strategic planning, systems integration, and technology.